Bird-X has made updates and improvements to last year's Installer Catalog; publishing the updated version on their website as well as in print. 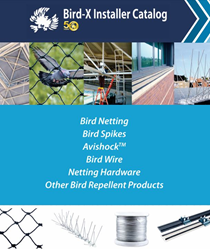 Bird-X has officially released their latest edition of their Installer Catalog, showcasing netting hardware, required tools, accessories, and professional-grade equipment. Additional categories are covered as well, such as Sonic Bird Deterrents, Taste Aversion Liquids, Bird Spikes, and more. The 2017 Installer Catalog features longstanding products like the Ultrason X, QuadBlaster QB-4, BirdXPeller PRO, and stainless steel and plastic bird spikes. New product features include OvoControl® P, ProHawk UAV Drone, and an expanded list of installer tools. “Our latest catalog highlights our best selling products and is an effective checklist for pest control operators and professional installers alike” said Dennis Tilles, President of the Bird-X Group of Companies. View the latest edition of Bird-X’s Installer Catalog in browser here. Installers may also call and request a complimentary hard copy.